Democrats were thrilled when Rep. Darrell Issa, R-Calif., retired. Then they looked at the mess on their side of the aisle. SAN JUAN CAPISTRANO, Calif. — It didn't take long for Democrats in this moneyed stretch of Southern California beach towns to go from schadenfreude-fueled joy to self-loathing panic. Last month, Rep. Darrell Issa, R-Calif., tormentor of the Obama White House, archvillain to liberals everywhere and perhaps the single most endangered Republican in Congress, read the writing on the wall and announced he would not stand for re-election. Democrats cheered. Then they looked at the mess on their half of the ballot and, as one party official put it, switched from champagne to vodka. "We got rid of Issa, that's the good news. But that's also the bad news because everyone and their mother is running on our side," said Ellen Montanari, who organizes weekly protests outside Issa's office and founded a group dedicated to flipping the district. Then there's the ugly news: Democrats are not merely trying to avoid a circular firing squad, but the prospect of forfeiting the race entirely under California's unusual "jungle primary" rules that could give Republicans both slots on the November ballot if Democrats split their vote. With six Democrats in the race — including two self-funding millionaires, and the former Marine colonel who nearly unseated Issa last time in the closest House race in the country — "it's an existential problem," warned Dave Lagstein, the political director of a local labor union. The risks are uniquely high in California. But the potential for crowded Democratic primaries to complicate the party's once-in-a-decade shot at flipping the House are not, and no one is sure what to do about it. Across the country, Republicans are salivating and Democrats are sweating their too-much-of-a-good-thing problem as the party's chief asset in this year's congressional elections, a bumper crop of strong recruits, is proving to be a liability too. "I will be the first to admit that what I would like to do is ship all of these candidates to a desert island for a season of 'Survivor,'" Terra Lawson-Remer said on an "EMERGENCY STRATEGY CALL" organized by anti-Issa forces. "But since we can't do that, I think we should pursue other options." Democrats are in the midst of a blue rush and no one wants to miss out, from first-time candidates motivated by President Donald Trump's election to veteran pols who are finally being coaxed off the benches. If you're a liberal with any interest in serving in Congress, you may never have a better chance than now. Trump's numbers are in the tank, liberal money is practically growing on trees, and history suggests Democrats will be swept into power, meaning you could be writing legislation and taking the Trump administration to task come Super Bowl LIII. Nationwide, an unprecedented 156 Democratic challengers had raised at least $5,000 by the third quarter of last year, according to a tally by the Campaign Finance Institute. That number was just 47 at this point in the last election. And before the GOP wave in 2006, the party had just 97 recruits, while Democrats had only 63 challengers before their 2006 blowout. That's great for Democrats in many ways, and competitive primaries have been shown to increase engagement and turnout in November. But crowded primaries can also waste money, sow internal divisions, push candidates to the ideological extremes, and tarnish whoever emerges from the melee. Of all the crowded primaries in all the congressional districts in all the states, few concern Democrats as much as the mess Issa left behind. Doug Applegate came so close to beating Issa in 2016 that he went to an orientation for new members of Congress in Washington before the race got called. Straight-backed with close-cropped gray hair, Applegate talks like a Marine colonel-turned-Bernie Sanders acolyte, because he is one. He immediately filed for a rematch, expecting a clear shot in 2018. A bevy of Democratic rivals jumped in, concerned the details of Applegate's messy divorce could prove electorally fatal in the new #MeToo era. His ex-wife had accused him of stalking and harassing her, it emerged late in the 2016 campaign, though courts later ruled in his favor and she publicly came to his defense. Still, Applegate remains the front-runner and sees an "establishment" plot to push him aside. "The DNC has the finger on the scales on this already," he told a gathering of Democrats in Del Mar in January, accusing his opponents of propagating a "whisper campaign" against him. Applegate called on weaker candidates to quit the race and get behind him, saying he would only support the winner if the primary is "fair." "If you aren't above single digits within the next 10 days and you stay in, we're going to have two Republicans in the general election," he said. That didn't smooth things over. "You sound like Trump!" yelled one man in the audience. Pick a competitive district anywhere in the country, and chances are you'll find more Democrats running than can comfortably fit on a debate stage. Rep. Barbara Comstock, R-Va., arguably the most vulnerable member of her party still running despite political headwinds, is working diligently to shore up her defenses in Northern Virginia. Democrats, meanwhile, are embroiled in a 10-way primary. Outside Dallas, Democrats couldn't find anyone to challenge Rep. Pete Sessions, R-Texas, two years ago, even though Hillary Clinton ended up winning the district. This year, seven Democrats are duking it out for the chance. And in a suburban Chicago district where Clinton won big, five Democrats have each already raised more money to challenge Rep. Peter Roskam, R-Ill., than his opponent did during the entire 2016 campaign. He ran unopposed in 2014. "Jungle primary" or not, Republicans are counting on overcrowded Democratic races to help bail them out of what is shaping up to be a very bad year. "We look forward to facing whoever limps out of the Democrats' battle royale: black and blue, and broke," said National Republican Congressional Committee Chair Steve Stivers. One GOP super PAC is even considering meddling in Democratic races to sow chaos and promote weaker opponents. "It'd be too much not to," said Cory Bliss, the executive director of the Congressional Leadership Fund. California has positioned itself as the leader of the anti-Trump "resistance." But nowhere is the danger for Democrats more acute, or the stakes higher. House Democrats' battle plan is built around the state, where they opened a sort of HQ2 early last year. Hillary Clinton won seven congressional districts currently held by Republicans, and Democrats are targeting another three on top of that, meaning California alone could supply close to half of the 24 seats necessary to flip the House. There is a golden opportunity in the Golden State, but Democrats live in fear of getting "Aguilared" — a reference to Rep. Pete Aguilar, D-Calif., who missed out on the ballot in 2012 because two Republicans finished ahead of him in the "jungle primary." In general, the liberal state's system favors Democrats. This year, for instance, Republicans are likely to be locked out of elections for both governor and Senate, which could depress GOP turnout statewide. But in places with a lot of strong Democrats and only one or two strong Republicans, the GOP has a chance to win both tickets to the main event in November. Famously conservative, Orange County went blue in 2016 for the first time since the Great Depression — thanks to demographic changes and college-educated whites' revulsion to Donald Trump — setting off a political realignment. It used to be like pulling teeth to find candidates here, Democrats say. Now, it's a free-for-all, with more than 30 Democrats running for four seats. There's a famed stem-cell researcher, a lottery winner who used his windfall for charity, former Obama administration and Senate officials, well-connected lawyers and businessmen, two University of California-Irvine professors, and an FBI advisor who helped organize the Los Angeles event where former director James Comey found out he was fired. "Two years ago, if we had any one of them we would have jumped for joy," said Orange County Democratic Party Chair Fran Sdao. Democrats are not sure what exactly they should do about their overabundance. They don't want to discourage participation, not to mention that Washington operatives don't exactly have a perfect record of identifying winners in the first place. Then there's the potential blowback in a party resistant to candidates being elected from on-high, rather than bottom-up, in the wake of the Clinton-Sanders battle. In a key battleground in Colorado, one Democrat — the grandson of a former congressman — publicly railed against "party apparatchiks" for trying to force him out of the race in favor of the "cookie-cutter" favorite. In Kentucky, Amy McGrath, the first female Marine to fly in an F/A-18 on a combat mission, fumed when Democrats recruited Lexington Mayor Jim Gray, whom they had been courting for years. A widely shared article in the anti-establishment news outlet The Intercept described a half dozen places where progressive candidates have clashed with bigfooting national Democrats. 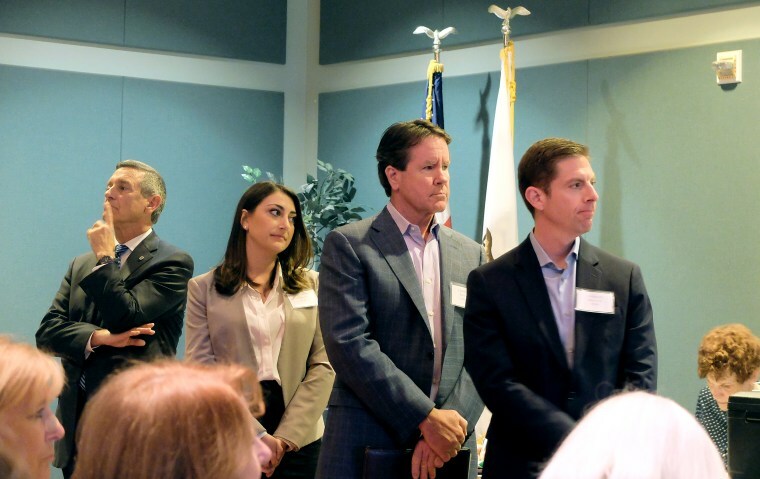 And anyway, party bosses have less leverage than they used to, so trying to cull candidates probably wouldn't work, said Mike Levin, the former executive director of the Orange County Democratic Party. "It's sort of like whack-a-mole — if you were to get one candidate out, another would pop up," Levin said. He would know — he's one of the six candidates running in Issa's district.